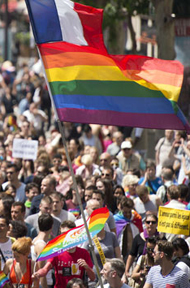 The city of Paris will celebrate Gay Pride month with a massive parade on Saturday that will wind its way for two hours from the Left Bank to the Place de la Republique and will culminate with a massive free concert that will be broadcast live on Radio Nova. Paris Pride is like no other LGBT gathering in Europe, drawing hundreds of thousands of people (estimates of the annual crowd range from 600,000 to 1 million) for a weekend of nonstop, raucous celebrating with their peers, friends, families and allies. And it doesn’t hurt that former Paris Mayor Bertrand Delanoe, who served from 2001-2014, is openly gay and throws himself into the Pride festivities with unparalleled excitement! The annual event is sponsored by the Interassociative Lesbienne, Gaie, Bi et Trans and organized by the LGBT organization Sofiged, which was founded in 1996 to also coordinate Europe’s yearly Europride events. Every major LGBT organization and business in France’s Ile de France region—as well as human- and civil-rights groups and AIDS organizations—registers a float or a walking contingent for the march. This year, a total of 65 contingents will be participating in the parade, including religious, health, political, social and athletic organizations. Also included in the march will be two American groups—LGBT Americans & Friends and representatives from the U.S. Embassy. 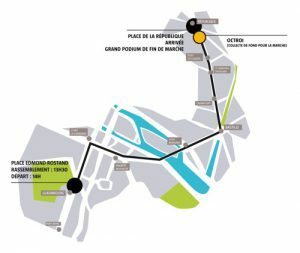 The march itself begins at 2 p.m. Saturday at the Place Edmond Rostand on the eastern edge of the Jardin du Luxembourg in the 5th Arrondissement. The 4.3 kilometer (2.7 miles) parade route proceeds up the Boulevard Saint-Michel toward the Seine, right on Boulevard Saint-Germain to the river, across the Pont de Sully, north on Boulevard Henri IV to the Place de la Bastille, then up the Boulevard Beaumarchais to the Place de la Republique. The free concert at Place de la Republique begins at 4 p.m., and will feature Scratch Massive, Maelstrom, Jennifer Cardini, Louis (e) City, Guena LG, Crame, Rag and several surprise celebrity guests. 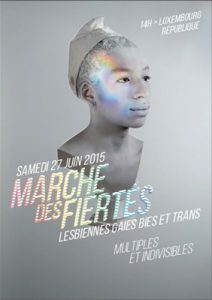 This entry was posted in Annual Events, LGBT Paris and tagged Gay Pride month, LGBT Pride, Marche des Fiertes LGBT by Bob Adams. Bookmark the permalink.